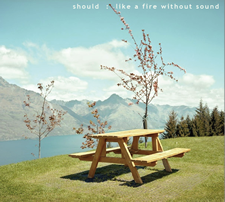 Like a Fire WIthout Sound: track-by-track. Marc's track-by-track guide to Like A Fire Without Sound was originally published in French by POPNews. I liked the idea of placing a rather unexpected song first on the album since it had been so long since our last album. In particular, the overly dramatic, string-laden bridge is something old-Should never would have done. I think this one shows a strong debt to Eno, particularly his album “Another Day On Earth”. With this album, I had in mind the idea of writing more straightforward pop songs, both in terms of music and lyrics. “Turned Tables” is probably the most successful at that, which is why I chose it for the second song on the album and the video. I love how the guitar and strings sound against each other in the bridge and at the end of the song. This song and “Just Not Today” were actually different parts of the same song early on. The album versions of both songs use the same guitar and keyboard sounds and have the same drums and tempo (although the drums are shifted two beats later). It’s interesting that no one has noticed these similarities yet, whereas several reviewers have commented that the intro guitar in “Slumberland” is almost the same as some of the guitar lines in “Turned Tables”, a perspective that was not on my radar until it was pointed out. Eric (my brother who has appeared on past Should albums but did not play on this one) contributed the chorus chord progression when I asked him for help. For the chorus I envisioned Roy Orbison, and am very happy with how it turned it out regardless of how much it invokes him. Lyrics on this album were approached differently than in the past. I would invent a story or situation and then write the lyrics from the perspective of a character in that story, without trying to be self-conscious about what was being said. Here, the story is just the simple pleasure of watching a young child struggling to stay awake at the end of the day. My favorite embellishment on this song is the stubby guitar notes with the spring reverb, which were a last minute addition. The song originally kicked back in after the breakdown that is now the end, but Eric had the insight to suggest ending it as you hear it on the album. This was the first song I experimented with doubling my vocals an octave up, which ended up working well and being used on some of the other songs. I think “But it had no permanence / Like my own disfigurement” is my favorite turn of a phrase on the album. It seems a lot of people pick this one as a favorite. This is a Disco Inferno cover. The song is only on the American version of their “In Debt” compilation that is comprised of their first single, album and EP. Based on the song’s placement on the compilation, and the fact that it was one of my favorites, for a long time I mistakenly thought it was the first song on their album, but it originally appeared only on a flexidisc compilation. Disco Inferno was such an amazing, creative band that hopefully will get some renewed attention with the imminent reissue of five of their EPs on one CD on One Little Indian Records. The title is an Eno reference and apt for the repetitive, cyclic nature of the song. I wrote this one when I thought maybe I was getting too far away from guitars. The tremolo guitar and the electric piano just blend beautifully. If it sounds like something off Yo La Tengo’s “And Then The Nothing Turned Itself Inside-Out,” then that is a huge complement. My favorite part is the backwards guitar that overlays the end of the chorus going back into the verse. Tanya has such a natural ability for harmonies, and they make this song. The story here is of a daughter who has never been able to get over the unfortunate death of her mother, who was a fashion designer who died young in a car crash on a stormy night. I aimed for the simplest of guitar solo (if you can even call it a solo). The ending is murkier than I would have liked. There are a lot of interesting bits that just don’t quite come through. Prior to 2005, Should songs were recorded with severe limits on what could be done, since I worked with an 8-track reel-to-reel recorder and a 1980’s-error sampling keyboard. Although I’m a great believer that limitations spark creativity and originality, limitations can also be frustrating when you can’t do what you want to the standard you aspire. The purchase of the music software Logic in 2005 enormously expanded how I could write and record songs, but it took a long time to find my voice with this new tool. Paradoxically, though, “The Great Pretend” is the very first song I started working on while learning Logic. I still remember the excitement I had at the ability to easily apply layer after layer to songs, and then change everything on a whim if I wanted. Here, I was aiming for a song in the vein of Eno’s “On Some Far Away Beach” and “Here Come the Warm Jets” – simple, soaring melodicism. But I wasn’t sure the song would make the album until Tanya improvised a brilliant bluesy take on the melody, which never would have occurred to me to suggest, but it gave the song that extra dimension it needed. The title is another Eno reference.